On 26 August 2016, His Beatitude Metropolitan Rastislav of the Czech Lands and Slovakia arrived in Moscow. The delegation accompanying the Primate of the Orthodox Church of the Czech Lands and Slovakia on his visit includes Archbishop Juraj of Michalovce and Košice; Archbishop Michal of Prague; Archimandrite Seraphim (Shemyatovsky), rector of the Representation of the Orthodox Church of the Czech Lands and Slovakia in Moscow; archpriest Nikolai Lischenyuk, rector of the Russian Orthodox Church’s Representation in Karlovy Vary; Hieromonk Alexander (Halushka), secretary of the Representation of the Orthodox Church of the Czech Lands and Slovakia in Moscow; and archdeacon Maxim (Durila), a cleric of the Prešov diocese. Among those accompanying His Beatitude is also Bishop Tikhon of Podolsk, administrator of the diocese of Hungary of the Russian Orthodox Church. 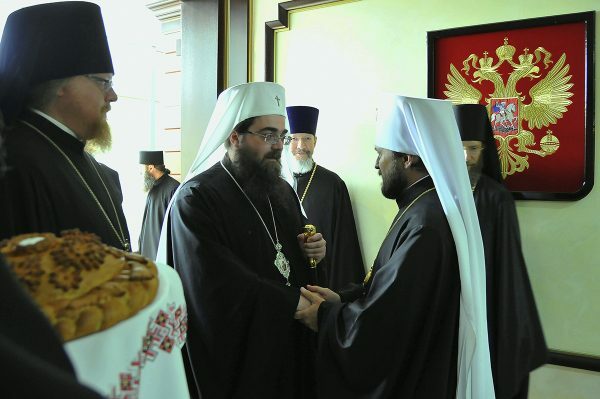 At the Sheremetyevo Airport Metropolitan Rastislav was met by Metropolitan Hilarion of Volokolamsk, chairman of the Moscow Patriarchate’s Department for External Church Relations; archpriest Nikolai Balashov, DECR vice-chairman; archpriest Igor Yakimchuk, DECR secretary for Inter-Orthodox Relations; Hegumen Feofan (Lukyanov), head of the DECR Protocol Sector; the Moscow clergy; and DECR staff members, Mr. Andrei Khoshev, Mr. Yevgeny Novozhenin and Mr. Denis Baturin. Metropolitan Rastislav’s visit to the Russian Orthodox Church will continue until September 2.